Preheat the oven to 350 degrees. 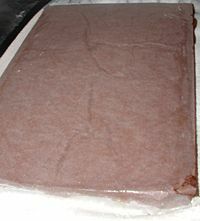 Lightly spray a 10×15 inch jelly roll pan. Line with parchment paper. In a large mixing bowl, beat the eggs on high for 5 minutes. They’ll be very pale and foamy. Gradually add in the sugar and beat another 2 minutes. Gently but thoroughly fold in the flour mixture. Melt the chocolate in a double boiler or in the microwave (see NOTES, below). In a small bowl, combine the coffee, the Kahlúa, the 2 tablespoons of sugar and the baking soda. Gradually stir into the melted chocolate, blending until smooth. 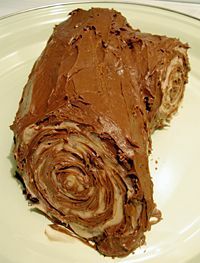 Quickly but completely fold chocolate mixture into batter. Pour batter into prepared pan. Bake a for 18 to 20 minutes, or until a toothpick inserted into the cake comes out clean. While the cake is baking, lightly sift an even layer of confectioners sugar over a clean, flat-weave dish towel (not terry cloth). Flip the cake out of its pan onto the prepared cloth as soon as it comes from the oven. Carefully peel away parchment paper. Dust top of cake with confectioners sugar, then trim away crisp edges with a sharp knife. Gobble them up now or save for decorations. 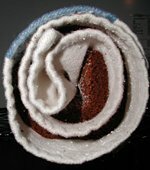 Starting with one of the short sides of the cake, immediately roll the cake up in the cloth, jellyroll style, and cool thoroughly on a rack. Melt the chocolate in a double boiler or the microwave. Set aside. In a medium bowl, combine cream cheese, powdered sugar, butter, and vanilla. Beat until fluffy. 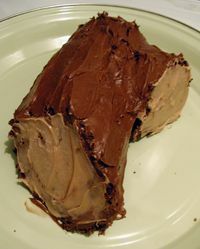 Reserve 1/4 cup of the icing for the “cut” parts of the log. Beat in the melted chocolate. Unroll the cake and spread the filling evenly over the surface. If you’re using pecans, sprinkle them evenly over the filling. Roll the cake back up and rest for an hour or so. Frosting: Melt the chocolate chips in a double boiler or the microwave. Set aside. Beat cream cheese with powdered sugar until smooth, then blend in the Kahlua and the melted chocolate. 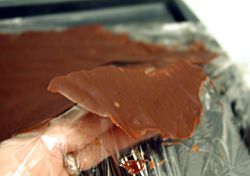 Bark: Cover a cookie sheet with plastic wrap. 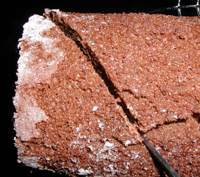 Break up and melt candy bar, mix in 1 teaspoon of butter and powdered sugar if you wish, then spread on plastic wrap and freeze while cake is cooling. 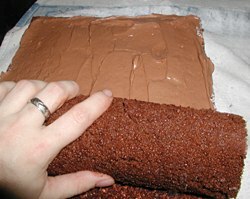 Cut and frost: Cut a diagonal chunk off of one end of the cake to make into a branch (see photo below) and set aside. Frost log, leaving ends unfrosted. 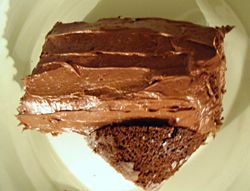 Use the reserved filling, as-is, or with a spoonful of dark frosting added for color, to frost the three ends of the cake. If you’d like, make “rings” on the cut ends to mimic the look of a real log. I wanted to avoid any specialty tools, so I simply used a chopstick. You could use the tip of a knife, or a fork drawn around in concentric circles, whatever you like. If you have cake-decorating supplies, pipe in the circles for a more polished look. 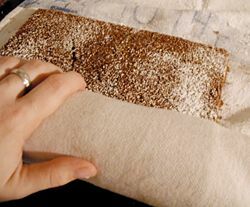 Finishing: Take the chocolate sheet out of the freezer and peel off the plastic wrap, breaking off irregular pieces of “bark” and layering them casually around the sides of the log. You’ll need to work quickly to keep the chocolate from melting in your hands, but that’s actually good, because you don’t want it to look too tidy. To make the holly, snip semicircles out of the sides of the lemon leaves to make them look like holly leaves. Stick them into the cake, and place 3 sour cherry candies in the center of the cluster for holly berries. If you like, sift powdered sugar around the plate or the log itself for a snowy look. If you’re careful, it’s easy to melt chocolate in the ‘wave. The key is to stop microwaving it before it’s completely melted. Break up chocolate in a microwave-safe bowl, nuke it for 30 seconds to a minute for starters, then stir until the rest melts. If it’s not about halfway melted at a minute, heat a bit more, checking on it every 20 seconds increments. The microwave makes chocolate easy to burn, so watch it! You can form a makeshift double-boiler by placing a heat-safe bowl over a regular saucepan. Whether you’re using a real double boiler or a makeshift one, the technique is the same. Place about an inch or so of water in the bottom pan and bring to a simmer with the empty bowl on top. Place the chocolate and coffee in the top bowl, stirring frequently, until chocolate melts. This entry was posted on Monday, December 11th, 2006 at 7:39 pm	and is filed under Desserts, Holiday & Seasonal, Master Recipe Index, Vegetarian. You can follow any responses to this entry through the RSS 2.0 feed. You can leave a response, or trackback from your own site.